Tooth whitening is a chemical process. The peroxide in the whitening agent breaks down into tiny molecules that are able to move inside the tooth structure, where they break down any molecules that cause discoloration. Because of this process, even if the entire tooth is not covered with bleach, the entire tooth is lightened. However, the structure of the tooth is not altered; the internal tooth color is simply made lighter. Enamel, dentin, and current fillings and cements are not affected or harmed by the peroxide. How long does the bleaching last? Bleaching results are very stable. However, depending on your nutrtion and lifestyle habits, bleaching may need to be redone periodically. Due to the safety of the bleaching agents, this should not cause any concerns. Will bleaching cause tooth sensitivity? Tooth sensitivity is a common side effect of bleaching. This sensitivity is temporary, and should disappear after the bleaching is completed. Even so, Opalescence products are available with Potassium Nitrate and Fluoride desensitizing agents already in them. Both the potassium nitrate and fluoride in Opalescence whitening gels help to ease the discomfort of whitening. However, if you have lingering sensitivity, talk with your dentist about other recommended sensitivity treatments. 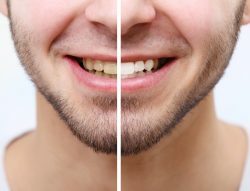 Will bleaching cause problems by weakening my teeth? Findings have confirmed that whitening with Opalescence PF products actually reduces cavities, minimizes sensitivity, increases enamel hardness, and improves the overall health of your teeth. Important: Whitening treatments should only be done under dental supervision! Tooth whitening treatments today are effective and safe, if they are used appropriately. This includes an initial diagnosis, professional teeth cleaning, briefing on the whitening process to be used, and then monitoring during the treatment phase. Self-treatment with over-the-counter (OTC) products poses risks for the teeth and gums, and often does not provide the results desired. Therefore, all products of the Opalescence system are medical products, and are dispensed or released only by dentists.